The station was rebuilt in 1989. 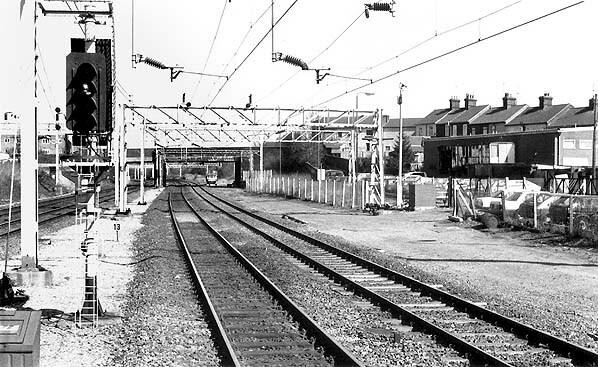 At this time the Dunstable line platforms were demolished and the site used for a new booking office and station car park. Notes: The first station, simply known as Leighton, was opened by the London and Birmingham Railway on 9th April 1838 as part of the first section of its line from London Euston to Denbigh Hall. The station had two facing platforms and was sited ¼-mile south of the Linslade tunnels. (These are arranged unusually for a four track main line: the southbound slow line has a tunnel to itself as does the northbound fast line, however the northbound slow and southbound fast lines share a tunnel. This stems from the fact that the line was built as double-track and, when quadrupled, the two extra lines could only be placed along both sides, as single-track tunnels.) There was no engine shed at the first Leighton station, but a turntable was provided prior to the opening of the Dunstable line to comply with a Board of Trade request. up platform which was protected by a canopy in front of the building. A subway gave access to the other platforms. A lattice footbridge at the south end of the station did not give access to the platforms and was for pedestrian access to Southcott Avenue on the west side of the line. 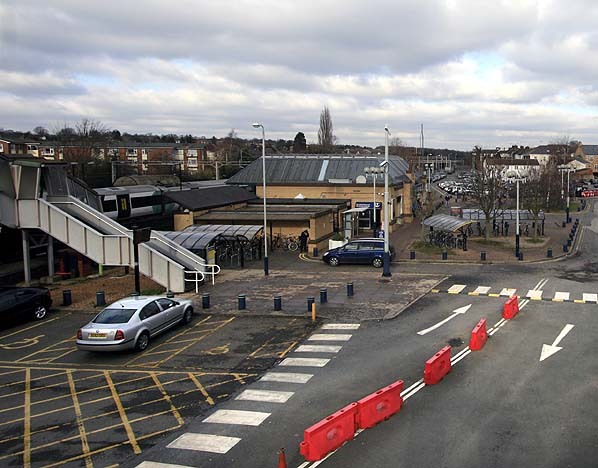 The new station had two island platforms and two side platforms with Dunstable line trains using the two shorter platform faces on the east side of the station. Access to the Dunstable branch was controlled by Leighton No. 2 signal box situated to the north of the station, while the actual branch signals were controlled by the main line box to the south. A two-road shed opened south of the station on the up side in 1859. It had two arched entrances which were later replaced and the building shortened, with a final re-roofing as late as 1957. 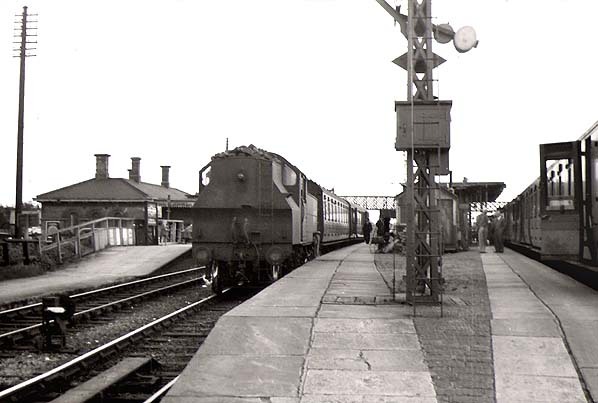 The depot was closed by BR on 5th November 1962. In 1874 land was purchased to the south of the station alongside the engine shed for the construction of goods sidings, which eventually became known as Wing Yard; it had a 5-ton crane but no goods shed. There were also a number of private sidings. The LNWR was absorbed by the London, Midland & Scottish Railway in the 1923 railway grouping and, in 1927, a crossover was added between the fast and slow lines. This was to play a significant role in the derailment of Royal Scot No. 6114 Coldstream Guardsman at Linslade on 22nd March 1931 when the driver took the crossover at 50-60 mph instead of the regulation 15 mph. 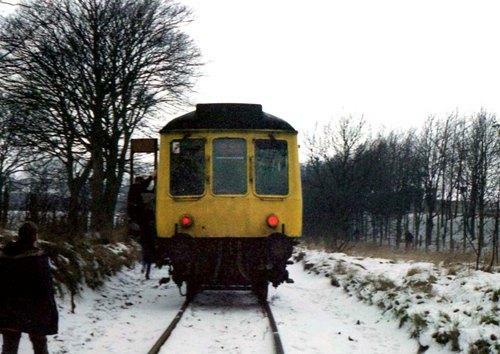 There had been a diversion in place on the fast lines, and the driver had missed the warning signals. The engine overturned and six people were killed, including the driver and fireman. The Great Train Robbery of 1963 occurred just south of this station, at Bridego Bridge near Ledburn - a bridge on the southbound stretch towards Cheddington. were put to other uses. The original booking office was retained at this time. By the 1980s the track through the platforms had been lifted. In 1989, the remaining platforms were lengthened to accommodate 12-coach trains and a £1.8m project to rebuild the station was started. As part of this rebuilding programme the Dunstable line platforms and the booking office were demolished with a new booking office provided slightly forward of the original building on what would have been the Dunstable line track. The remainder of the track bed was used for a new station car park. The station is served by London Midland and Southern, and is managed by the former. Southbound, three London Midland trains depart per hour on weekdays, one of which sometimes runs non-stop to London. Additionally, one Southern train per hour runs to East Croydon. Northbound, two trains an hour run to Milton Keynes Central, one from each operator. A third train runs to Northampton, whilst the fourth runs to either Rugby or Birmingham New Street. April 1860 the HL & DR informed both the Eastern Counties Railway and the GNR that they were terminating the 1858 agreement. The GNR immediately took steps to take over the line because of its strategic importance as a link between the three main lines; a Parliamentary Bill was prepared to facilitate this. At this time the line was nearing completion, with a special train carrying LNWR officials on 12th June and another 'special' on 17th July for company shareholders. After passing its Board of Trade inspection, the line between Luton and the Great Northern was opened to both goods and passenger traffic on 1st September 1860 with intermediate stations at New Mill End, Harpenden and Wheathampstead. At this time a Sunday service was introduced for the first time. Although built as single track throughout, it was always the intention that the line would be doubled, and sufficient land was acquired over some of the route. In the late 1890s the Great Northern line between Digswell and Hatfield was widened with a new track being provided for Dunstable trains, and the old Dunstable line becoming the new down slow main line. The line remained open for freight traffic until 1st January 1966 after which it was cut back to Grovebury sidings south of Leighton Buzzard, serving sand and gravel pits, until final closure on 5th December 1969. 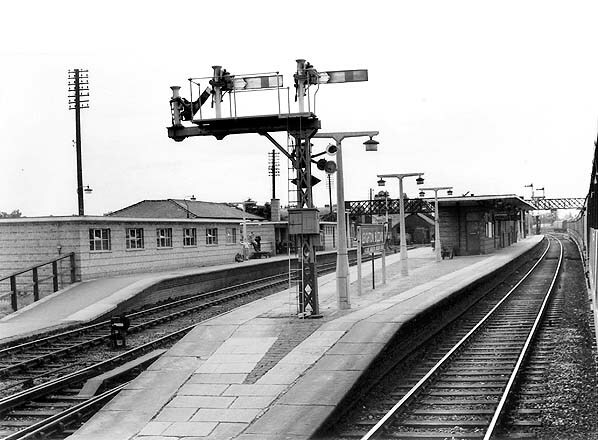 Track-lifting was piecemeal, starting at Dunstable in late 1968 but not reaching Stanbridgeford until July 1969. Track-lifting west of Stanbridgeford started in February 1970 and was not completed until February 1971. National Cycle Route 6 now follows the line between Stanbridgeford and Dunstable. London Extension centenary celebrations. The last passenger excursion was on 17th January 1987 when Hertfordshire Railtours’ 'Chiltern Chariot' visited the line running to the Dunstable cement works via the Vauxhall sidings. The line was finally closed to all traffic when trains to the oil depot at Dunstable were withdrawn in 1989, by which time the line had just one train per week. Apart from the section through the site of Bute Street station, the track was then mothballed. Other web sites: Lost lines - features photos taken along the line between 1989 and 2007. BBC Beds, Herts & Bucks web site. Disused Railways web site. 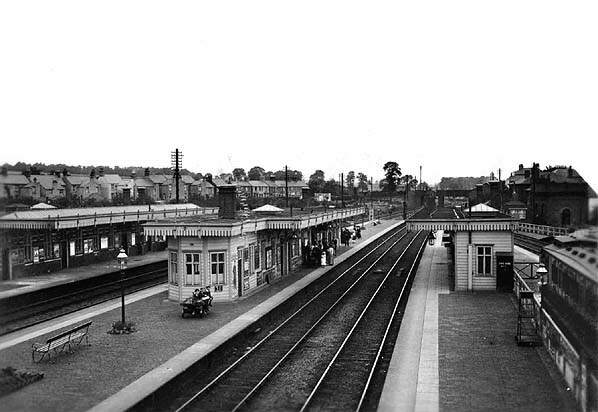 Leighton Buzzard station looking north c.1925. The Dunstable line platforms are to the right. 1925 1:2500 OS map showing the station, goods sidings and engine shed. The Dunstable branch is seen diverging at the bottom of the map. seen beyond the bridge. Loco 58887 is a Webb 2F coal tank. Built in December 1881 at LNWR's Crewe works, it was numbered 252. Passing to the LMS at grouping, it was renumbered 27596, then at nationalisation it was renumbered 58887 and allocated to 8A, Edge Hill shed. 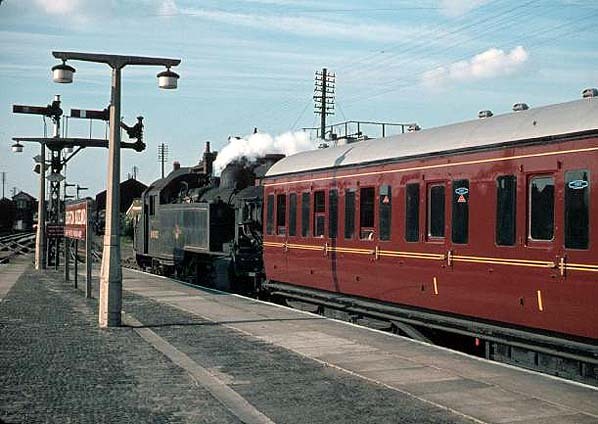 It was fitted with push-pull apparatus for working the Leighton Buzzard - Dunstable branch and allocated to Bletchley shed, 4A, from where it was withdrawn in 1955 and cut up at Crewe works later that year. One Coal tank is preserved:1054 is undergoing a major overhaul on the Keighley and Worth Valley Railway. 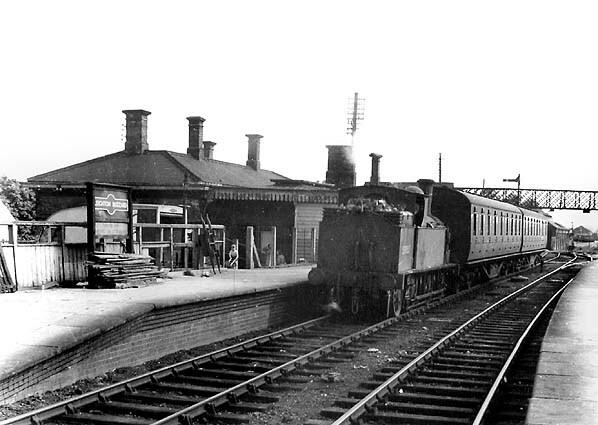 A Dunstable train (left) has just arrived at Leighton Buzzard station in 1956. 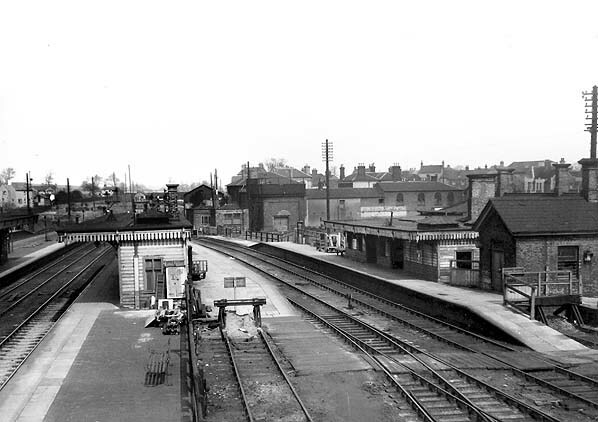 Leighton Buzzard station looking north c.late 1950s. The Dunstable line platforms are on the right. 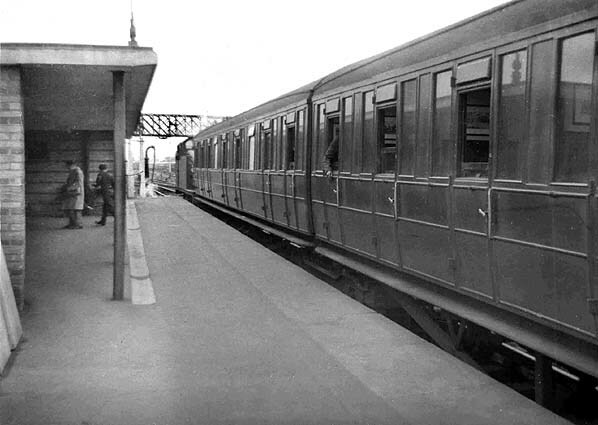 A Luton train awaiting departure at Leighton Buzzard station in 1960. 84002 at Leighton Buzzard station in June 1962 with a train that has arrived from Dunstable. 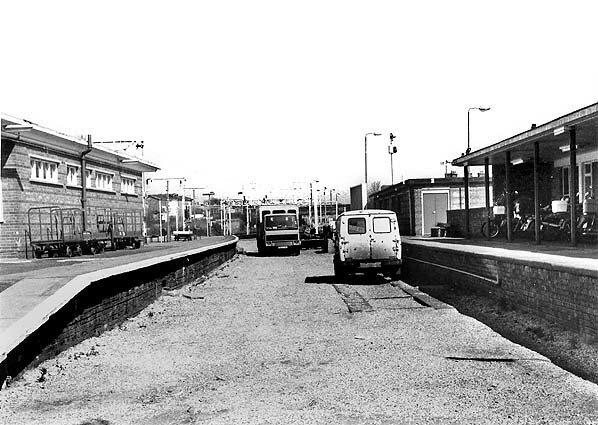 Leighton Buzzard station looking south c.early 1960s. The Dunstable line platforms are seen on the left. 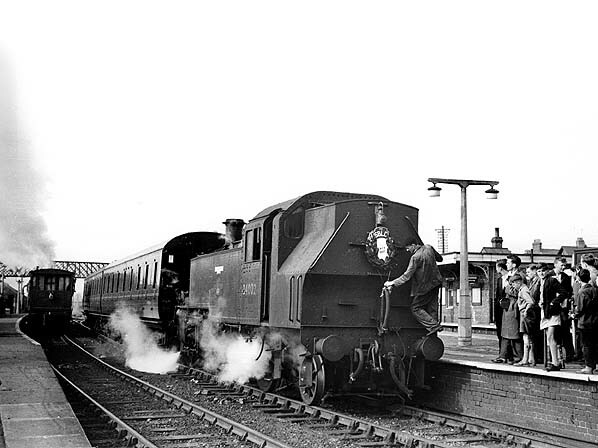 Passengers are seen on the former up platform, so clearly they were used by other services after closure of the service to Dunstable North in 1962. The original booking office can still be seen behind the new building, with a new canopy over the platform. BR2/2 84002 with the 8.25 am train from Luton Bute Street has just arrived at Leighton Buzzard station on 30th June 1962, the last day of pasenger service. Looking north at the disused Dunstable line platforms in March 1989, the new canopy in front of the booking office is seen on the right. 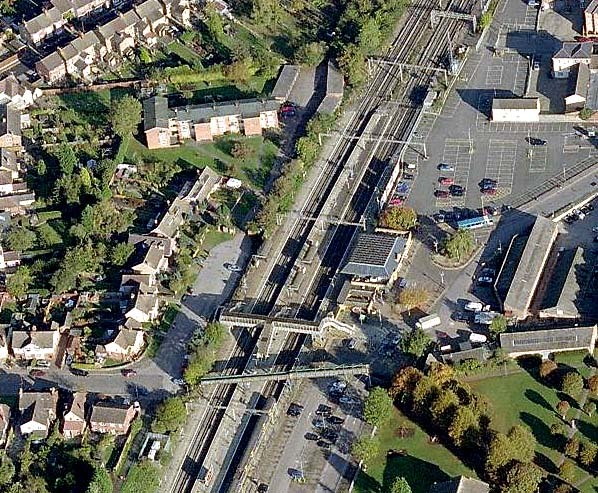 Recent aerial view of Leighton Buzzard station. The new station building to the right stands on the site of the Dunstable line platforms. The site of the Dunstable line platforms at Leighton Buzzard station, looking north in January 2011.